THE HAUNTED PALACE: A Lovecraft In Poe’s Clothing – Schlockmania! The Haunted Palace is often lumped in with Roger Corman’s cycle of Edgar Allan Poe adaptations for American International Pictures. That’s primarily the doing of A.I.P., who insisted on drawing the title from a Poe poem and opening and closing the film with a few quotes from said poem. However, the film actually finds Corman taking a brief break from Poe by adapting the H.P. Lovecraft novella “The Case Of Charles Dexter Ward.” The result isn’t that different from the approach of Corman’s Poe films but does offer some interesting textural differences in storyline and style. 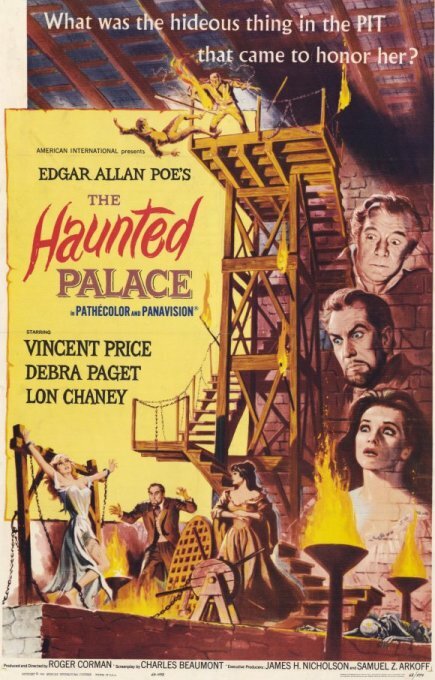 The Haunted Palace starts in a rousing fashion with an opening reel that depicts the villainy and burned-at-the-stake demise of Joseph Curwen (Vincent Price), a wicked sorcerer who puts a curse on the town of Arkham before he goes up in flames. 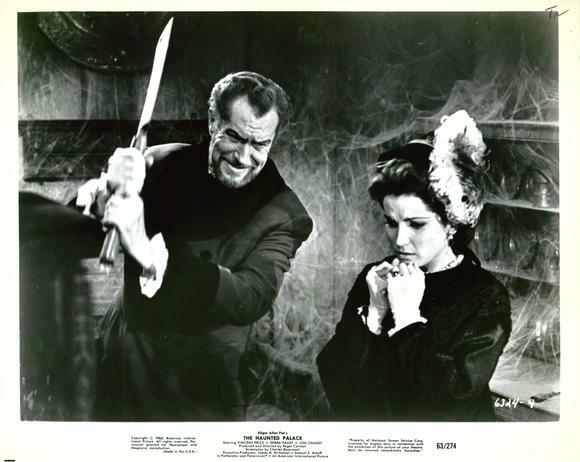 Many years later, his descendant Charles Dexter Ward (Price again) inherits his mansion and travels to Arkham with his wife Ann (Debra Paget) to see it. The townspeople are secretive and unfriendly, with the exception of kindly Dr. Willet (Frank Maxwell), but Ward presses on with his task. He soon discovers that the Curwen family bonds can have a supernatural power – and not only does Joseph want his old black magic resumed, he also wants revenge on the descendents of the townspeople who executed him. The results feel like Corman applying the gothic-shock approach he developed on his Poe films to Lovecraft material. Beaumont’s script is solidly plotted and weaves in clever references to a number of concepts from other Lovecraft tales (Arkham, the Necronomicon, etc.) but it drags a little during the midsection. Also, the state of special effects technology circa 1963 and the budget/schedule work against Corman’s attempts to portray Lovecraft’s eldritch horrors – one big creature effect during the finale falls noticeably flat – so Corman and Beaumont both devote more time to doing the kind of “old dark house” and undead spirit-type horrors from the Poe film cycle. That said, The Haunted Palace is a solid programmer if viewed on its own merits. 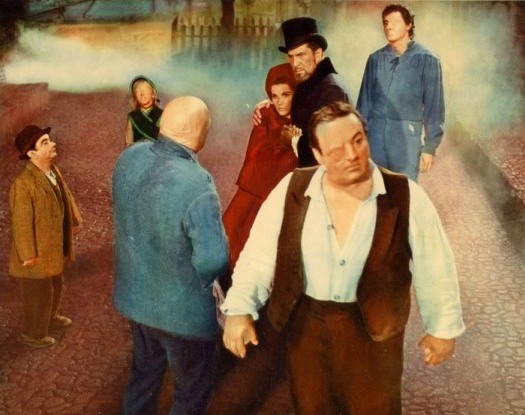 Corman had a confident grasp of horror film technique by this point and shot the film entirely on sets to get a surreal, stylized look that is quite effective: the foggy Arkham streets and skeletal forest have a particularly striking look. As usual, Daniel Haller’s impressive sets have the right sort of gothic grandeur and Floyd Crosby’s cinematography weaves wonders from shadows and fog. Ronald Stein composes the score here and achieves a doomy feel that is subtler than the Les Baxter scores from the early Poe films. Corman harnesses their talents and effectively and uses their work to craft some wonderful sequences, including the breathless opening reel and a great scene where Price and Paget are surrounded on the street by Arkham’s mutated citizens. The Haunt ed Palace also has one of the best casts for a Corman production of this era. The supporting cast is packed with a number of familiar faces, including Leo Gordon and Elisha Cook Jr. as important men in the town and a wonderful, subtly ominous turn from Lon Chaney Jr. as the caretaker of the Curwin house. Paget is also compelling and sympathetic as Ward’s long-suffering wife. That said, it is Price’s show all the way: he gets to not only play a dual role as Curwen/Ward but also gets to portray Ward being possessed by Curwen. He handles the shifts of persona like a pro and brings a palpable sense of delight to Curwen’s wickedness. In short, The Haunted Palace is a second-tier entry within the list of the Corman/Price collaborations… but that duo’s second-tier material is worth a lot of horror filmmakers’ first-tier material from the same era. If you enjoy their collaborations in the Poe arena, you’ll find this little sidetrip into Lovecraft territory worth taking. NIGHT OF THE DEMONS (1988): A Party Movie For The Unholy?